Caffiend – Caffeine Tracker released! We are very proud to announce the release of Caffiend – Caffeine Tracker for iOS. 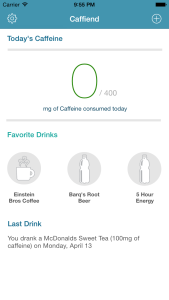 Caffiend takes advantage of iOS Health to enable you to track your caffeine intake and make yourself healthier. Many people struggle with falling asleep, and drinking too much caffeine can play a large part in that problem. With Caffiend, you can use our built in database of drinks, foods and other items to track how much caffeine you consume in a day. With iOS Health integration you can monitor this over time and even share with your doctor if you choose. We also support custom drinks, so you can assemble a list of your own personal drinks to track in addition to our provided database. We offer quantity increments for drinks and also a favorite feature, which allows you to quickly access and add three “favorite drinks” right from the Caffiend home screen. For keeping tabs on how much you have drank during the day, we offer a Caffiend notification center widget and an Apple Watch app and glance. We hope you enjoy using Caffiend! It is available now, on the iOS App Store for $0.99. Get your copy today! Posted in Caffiend, NewsTagged app, caffeine, caffiend, health, iOS2 Comments on Caffiend – Caffeine Tracker released!